It's from their grandmother, or great-grandmother, and it's just the perfect way to gather crumbs off the table. It's the curved handle that does it. And the pretty bin. I know, I know: it's a brush and dustbin. But I guarantee you that nobody (not my children, not myself) enjoys clearing the crumbs off the table with a little broom and dustbin. Or a sponge (yuck). Or their hands (ugh). It's only fun if you're using an antique, curved, pretty-shaped ramasse-miette. And yes, the chore is more fun if you actually say the name of the thing in French. When you live in a country where you not only eat a lot of bread, but they don't believe in bread plates, a crumb-gatherer comes in quite handy. Bread is usually put on the table -- beside the main plate -- so it can get quite messy. With the sudden realization that we wanted -- nay, needed -- an antique (or at least antique-style) ramasse-miette, we started looking. It turns out that in modern stores, you get only a modern, plastic brush-with-dustbin combo, and that is just not the same thing. So when we go to a garage sale on one of our stays in Bretagne, we have our eyes peeled for one. We look at each and every stall, to no avail. Until finally, we are standing at a stall for what seems like forever as Pippa begs and pleads to be allowed to buy the ugliest fake gold dolphin imaginable. While we are debating this, the owner takes out some more merchandise from a box and fills in some gaps on the table. Gigi hisses at me, dramatically, "Mom, look! It's a ramasse-miette!" Because the handle on the bin part of it is broken, we get it for a fabulous deal -- 8€. Including the god-awful dolphin pin. We believe it's from around the 1920s, and I think it's probably silver-plated (certainly not solid silver), and the brush is in good shape. Of course, I am not an antique expert, so I could be totally wrong on all of this. But in any event, we quite like it. Gigi in particular loves to ramasse the miettes and we have literally ﻿had to put crumbs back onto the table so that she can be the one to scoop them off. This is not just a northern France thing. At our friend's house in Provence, we see this beauty. ﻿I think if I can ever find a scalloped-shaped one, I will certainly end up with a second ramasse-miettes. It will be the start of a collection of crumb-collectors (poor Anthony). I see this one at a garage sale in Paris, at 30€ (at least, that was his starting price) and it's pretty, but there's something about the squareness of the bin that just makes it look less fun to scoop into. This is not logical, I know. But if I'm the one collecting the crumb-collectors, I'll collect the ones that look fun to collect crumbs with. Also seen at the same garage sale where I buy my ramasse-miettes: this cheese-cupboard for the table. Though I love the fact that it's a cheese-cupboard, nothing else about the look or form of it really spoke to me. And I didn't want to have to haul it around France on the myriad trains we were about to take, so I left it there, for some other treasure hunter to discover. And this display of enamel pitchers. I think I should've bought the blue-gray one in the background, just because I think it would be so much fun to paint a still-life of it in the right lighting. 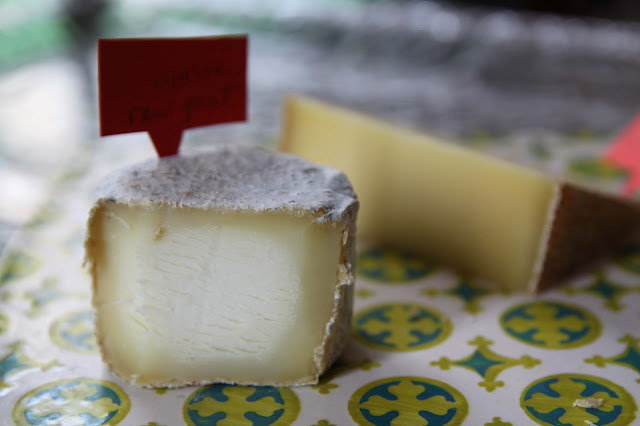 Crottin de Chavignol is pretty ubiquitous -- a raw goats' milk cheese shaped into a little plug. But the Crottin Repassé is something different. Actually, it's the same cheese which is then placed in a stone jar and aged for at least two months, often four months or more. During this stinkification process, as you can imagine, not only does the aroma change, so does the color and texture. The fat actually migrates to the outside, so that the edges are chestnut colored and oozy; don't forget to buy the bread. The heart can, paradoxically, dry out, and the crust gets very thick, so it's an interesting combination of crumbly and creamy. The word "repassé" is most commonly translated as "ironed", but here it's more passed-over (and re-passed over) in the sense that for four months, it's just sitting around and getting increasingly potent. It ends up with an astringent, ammonia taste that some say goes well with a fruity white wine -- if you like a little ammonia with your hints of pear. This one is for stinky cheese-lovers only. Though I had hoped to find a cheese whose name suggests the gathering of crumbs, I am happy to find one that at least references another household chore -- ironing (repasser). While the members of our family are all happy to gather crumbs with our fancy ramasse-miettes, nobody is clambering to iron. Ever. If you are eating Crottin Repassé and the cheese crumbles, you can use a sponge, sweep it up with your hand, or use a dustbin and broom, but believe me, you'll have more fun if you're using a fun-shaped antique ramasse-miettes. I cannot tell you why; it's completely illogical.